Why yes, yes I did strain the seeds from my blackberries only to add other seeds back in. I'm crazy like that. But the thing is, blackberry seeds are annoying. They're hard and annoying and they get stuck in your teeth. Chia seeds, on the other hand, are suspended in their own gel orb - that makes them fun and the opposite of annoying. Endearing? Enchanting? Pleasing! Okay, they also occasionally get stuck in your teeth...but they're much easier to wiggle out. If you follow me on Instagram, you probably know my affinity for chia. I have affectionately dubbed it my #DailyChia, but I stopped sharing it all the time, because I'm sure people were fairly irked at seeing my bottle filled with various hued liquids with those pleasing little bubbles suspended inside. You know - daily. Now, my "regular" daily chia is a mix of the seeds, coconut water (with or without pulp), and a random juice or tea. It's easy. I shake it up in a bottle in the evening and stick it in the fridge. Come the next day, my omega-3/calcium/fiber-rich beverage is at my fingertips. 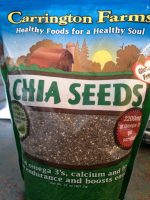 It's said that chia seeds boost both endurance and energy, and I totally agree. Whether real or psychological, I drag on the days when I forget it. In lieu of the easy route, I like mixing up some fresh limeade or lemonade or an agua fresca if we have some extra fruit hanging around. In this case, it was blackberries. 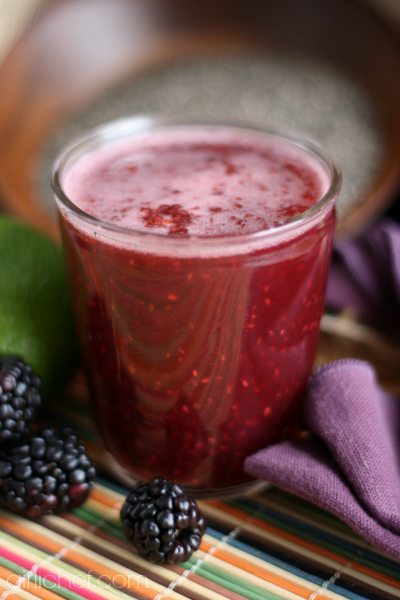 The berries give it a gorgeous deep purple hue, the lime juice adds a hint of tartness, and the agave nectar can be adjusted for sweetness (I like mine lightly kissed, but you could go for a full-on snog session, if you're feeling feisty). 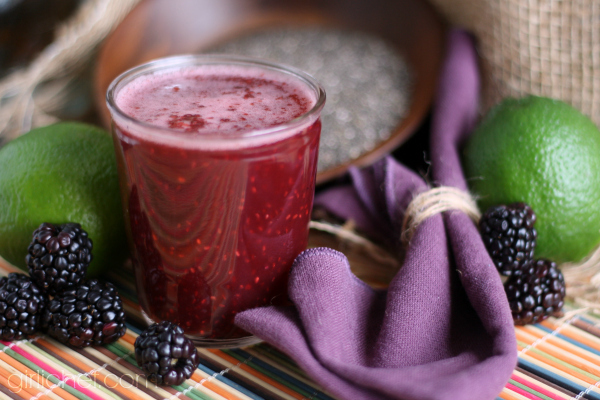 Fresh blackberry agua fresca infused with fiber-rich chia seeds. 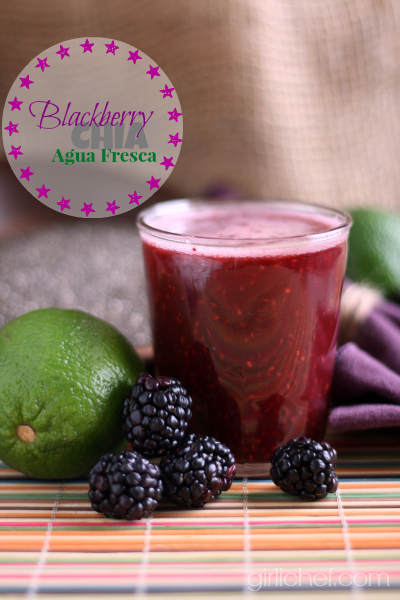 Puree half of the water, the blackberries, agave nectar, and lime juice in a blender until smooth. Strain into a pitcher (to remove the seeds), and stir in the remaining water and the chia seeds. Refrigerate for at least 4 hours; serve over ice. I received a free bag of Carrington Farms Chia Seeds for the purpose of sampling. I received no compensation to mention them in this post, and I've used chia seeds in several recipes prior to trying this brand. Carrington Farms is a leader in the organic food industry and also carries flax, flax-hemp and flax-chia blends as well as a variety of coconut oils. I haven't found much difference in the quality of different brands of chia seeds, but that said, I very much enjoyed this brand. All opinions stated in this post are my own.